The Most Elegant Wedding Show in Sarasota! The Bridal Show on August 21st at the Hyatt Regency Sarasota gave away $2000 to a lucky bride. The Runway Fashion Show featured the latest bridal fashions. Brides & Grooms got in FREE. 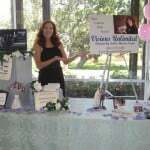 Visions Unlimited Video Productions, Inc. showed DVD samples of Wedding Videos on a TV at booth #29, right between Al Gordon Photography and Holiday Inn Lido Beach. Educated questions were answered by the best Wedding Vendors in Sarasota. We were there to answer your questions about videography, photography, wedding planning, formal wear, reception locations, etc. The catered food tastings and wedding cake sampling was divine. The Hyatt staff was stella.